BYRNS, Joseph Wellington, (father of Joseph Wellington Byrns, Jr.), a Representative from Tennessee; born near Cedar Hill, Robertson County, Tenn., July 20, 1869; attended the common schools; was graduated from Nashville High School in 1887 and from the law department of Vanderbilt University, Nashville, Tenn., in 1890; was admitted to the bar in 1890 and commenced the practice of law in Nashville; member of the State house of representatives, 1895-1901; member of the State senate in 1901-1903; unsuccessful candidate for district attorney general of Davidson County in 1902; elected as a Democrat to the Sixty-first and to the thirteen succeeding Congresses and served from March 4, 1909, until his death; chairman, Committee on Appropriations (Seventy-second Congress); majority leader (Seventy-third Congress), Speaker of the House of Representatives (Seventy-fourth Congress); chairman of the Democratic National Congressional Campaign Committee 1928-1930; was a nominee for reelection to the Seventy-fifth Congress at the time of his death; died in Washington, D.C., on June 4, 1936; funeral services were held in the Hall of the House of Representatives; interment in Mount Olivet Cemetery, Nashville, Tenn.
Papers: In the Herbert Hoover Papers, 1922-1933, 45 pages.. Much of the material concerns endorsements for public appointments. A finding aid is available in the repository. Papers: Includes scrapbooks and portions of his library. Most of his papers were destroyed by fire. Galloway, Jewell M. "The Public Life of Joseph W. Byrns." Master's thesis, University of Tennessee, 1962. ------. 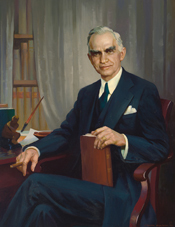 "Speaker Joseph W. Byrns: Party Leader in the New Deal." Tennessee Historical Quarterly 25 (Spring 1966): 63-76. Irish, Ann B. Joseph W. Byrns of Tennessee: A Political Biography. Knoxville: University of Tennessee Press, 2001.